Wow! 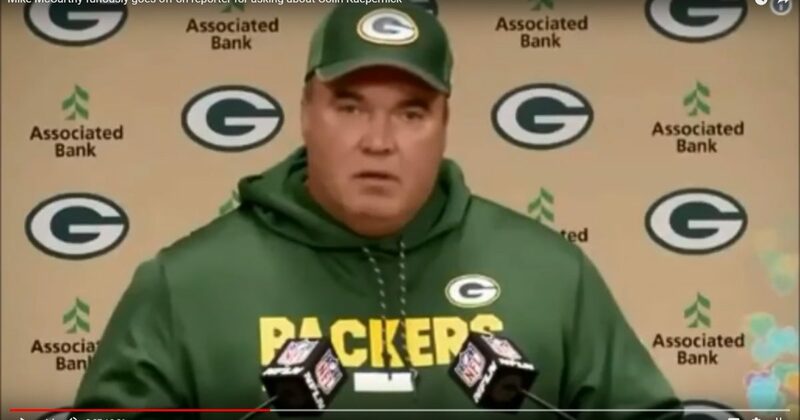 Packers coach gets really pissed when asked twice in a row if he is going to hire Colin Kaepernick now that Aaron Rodgers is hurt. NO! Liberal weenie reporters in the sports arena are no less obnoxious than liberal weenie reporters in the political arena. Any opportunity they can get to ask a question that might paint the answerer as a racist or bigot, they are going to take it, regardless of whether the question has been answered already. Watching Sarah Huckabee Sanders go through this drill daily is maddening. It is no less maddening to watch in what is left of the NFL. McCarthy understandably blew up, staring at the reporter. Green Bay Packers head coach Mike McCarthy bristled when a reporter asked if he was considering bringing in Colin Kaepernick with star quarterback Aaron Rodgers potentially out for the season due to a broken collarbone. During a news conference on Monday, McCarthy said the Packers will be forging ahead with backup quarterbacks Brett Hundley and Joe Callahan. “Is there any idea of bringing Colin Kaepernick in to compete for that backup job?” a reporter asked. Kaepernick, who has been at the center of the controversy over players refusing to stand for the national anthem, has been a free agent since he opted out of his contract with the San Francisco 49ers in March. A Change.org petition for the Packers to sign Kaepernick has received thousands of signatures. Watch the “Varney & Co.” panel react below.